In five years you’ll be the same person you are today except for the people you meet and the books you read. I used to think books could change the world, but I don’t believe that anymore. Books don’t change the world–quotes from books change the world. Unless you’ve got a photographic memory you can’t remember 5% of a book the second you put it down. You remember vague concepts, and perhaps you can quote a line or two. If that book comes to impact your life in any substantive way it will be because you remember a line from it and repeat that line to yourself 20 times a day. In order to remember more of the book and reap the benefits you may read it repeatedly, but even so you’ll retain only a small part of it in your consciousness. Other small parts of it will come to your consciousness when triggered by a relevant event. But it is not the book that changes you, it is those few lines or quotes which, when repeated over and over and over again, change your behavior. When your behavior changes, then you change. When you change, those around you change. Then the world changes. The power of the book is to be a delivery mechanism. But it is the quotes from the book, the few you can remember, that hold the real power. These are affirmations. The word affirmation comes from the Latin affirmare, which means to make steady or strengthen. Affirmations are positive self-talk. They are the things you say to yourself, out loud or in your mind, that encourage you to greatness or which help you overcome challenges. Bestselling author Ryan Holiday had the titles of two of his books, The Obstacle is the Way and Ego is the Enemy (both definitely worth reading if you’re an aspiring influencer), tattooed on his forearms so they would be constantly at the forefront of his consciousness. These are affirmations. Affirmations can be quotes, sayings, or simply thoughts. Affirmations are not long-winded stories–they are short phrases. If they’re too long the mind can’t retain them in consciousness easily, they aren’t used as often, and their effectiveness is blunted. Even if you’re never heard about affirmations and this sounds a bit too touchy-feely for you it doesn’t matter–you are already using affirmations in your life. Everyone does, and they’re not always positive, although that’s how I will generally refer to them. When I say “affirmations” you can take it for granted I’m referring to positive affirmations unless I state otherwise. That said, it is important to talk about negative affirmations and the harm they do. Negative affirmations are just as powerful as positive affirmations. If you are constantly telling yourself “My wife always forgets stuff,” that will affect your behavior. The point isn’t whether this is a fact or not–your wife may indeed be forgetful, the point is that if you tell yourself this all the time then your behavior will be different than it would be otherwise, and if saying this to yourself every day means you become a nag and are constantly putting your wife down for her forgetfulness you may end up divorced and have no idea how much of it was your own fault. The problem with many negative affirmations is that they’re simply not true. In cases where they are true, they’re still not helpful. Negative affirmations don’t solve problems because they entrench negative behavior. Positive affirmations are the antidote. Brainwashing? Exactly. The truth is I’m not close to being in as good of shape as Rich Roll, I have trouble resisting temptation, and a lot of plant based foods don’t taste that good to me, like the green smoothie my wife made this morning (normally they taste great, they really do, but that one was too heavy on the Swiss chard). But the current facts don’t matter–if I repeat these positive affirmations to myself I exercise more and eat better and the affirmations produce the reality I want. I started writing up this section, and then it got bigger, and bigger, and then it became it’s own fairly large blog post, 7 Reasons Why Positive Affirmations Don’t Work. Go read that, then come back here. In the early 1990s an unknown actor wrote himself a check for $10 million for “acting services rendered.” He dated it for 1995. Then he carried it around in his wallet for inspiration. In 1995, that actor, Jim Carrey, made exactly $10 million for his role in Dumb and Dumber. You know who else uses positive affirmations? Everyone, including you. You may not use them the way life coaches talk about using them, but you still use them every day. Every time you tell yourself something positive about yourself, every time you repeat a thought that helps you work through something or keeps you going, you’re using affirmations. Have you ever said any of these things to yourself? This mess is an opportunity for me to learn something. This problem at work is a chance for me to prove what I’m capable of. Dang, I’m not going to say this out loud, but I did a pretty good job right there. I like how I look in these clothes. Not bad. I’m going to get this job. I’m going to land this client. It’s that last one that led me to start my own business. In 1999 I was working for a dot-com in Provo, Utah, making $13/hr as a web designer, and watching the two founders fly around and meet with venture capitalists and partners. I looked at them and thought “These guys aren’t geniuses–I could do what they’ve done and what they’re doing.” So I quit and started my own company, a marketing agency. But the biggest success in my professional career almost didn’t happen, because of a negative affirmation. I accepted the offer and three years later I’ve written over 200 articles for Forbes, Time, Inc., Mashable, TechCrunch, Entrepreneur, and more, I have a multi-million dollar, global marketing agency, I landed a book deal, and I get paid to travel around the world and speak. Thank goodness for that positive affirmation when I needed it. You use positive affirmations every day, much more than you think you do. The trick to harnessing their real power is to use them on purpose, rather than by default. Start today. I view affirmations like physical exercise–painful and awkward at first, but the results build upon themselves over time. Affirmations are a marathon, not a sprint. Like a marathon the results come after lots of preparation, rather than a one-time spontaneous exertion. It’s hard to repeat a negative affirmation to yourself 50 times a day for 10 years and then suddenly counter it with a positive affirmation when a moment of opportunity comes your way. 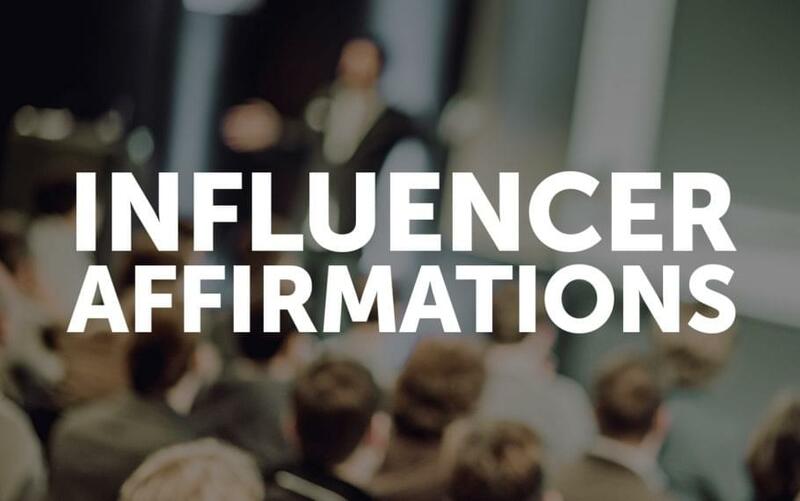 That’s why if you want to become a successful influencer you need to start using positive affirmations immediately–today. Do it for 30 days, every day. You may have heard that it takes 3 weeks of doing something every day to make it a habit. That’s not quite true–there are more factors that go into making something a habit than doing it for a certain number of days. But if I committed you to do these affirmations for a week it wouldn’t be enough, and if I asked you to do them for a year you wouldn’t commit. 30 days is short enough to get you to say “Ok, I’ll try this out, it’s not that big of a commitment,” and long enough that you should be able to see results and then decide if you want to keep on doing this. That’s it–simple. Are you up for the Influencer Affirmation Challenge? If you are going to do it, tweet to me right now to let me know. Struggling to find your own affirmations to help you become a better influencer? Here’s my list (subject to change), along with explanations of why I use each one. Feel free to copy it as your own, or modify them to suit your needs. Note: These are not my personal, general affirmations, there are my influencer-specific affirmations. Someone, somewhere, will be helped by what I have to say. I have to believe what I have to say will help someone, otherwise why am I doing it? How do I know if what I have to say will help someone? See #2. Where’s the money? The best way to know if what I have will help someone is if they’re willing to pay for it. If they’re not willing to pay for it, it must not hold much value for them. Want to help as many people as possible? Follow the money. There’s another reason to follow the money–it allows you to scale up your operations and help more people. Could I help more people if I had a team of 10 people behind me helping me to share what I know? You bet! But I can’t afford to hire any of those people unless I’m making money. Until I make money I’m limited as to how much value I can provide, and if I firmly believe #1 then I have an obligation to make money, scale my operation, and help as many people as possible, as much as possible, as quickly as possible. Start right now. This used to say “start today” but it’s too easy to push things from the morning to the afternoon, from afternoon to late afternoon, and then nothing happens. It’s soooo easy to procrastinate. I put off doing video for years this way. Don’t wait, whatever it is you know you need to do–do it right now. Don’t let perfection be the enemy of good enough. This is one of the main reasons people don’t start right now–you’re waiting to get everything organized so you can do it as awesomely as possible. You know what isn’t awesome? Doing nothing. You know what is awesome? Providing value today. Can you provide great value, today, without high production quality video? Can you write a blog post on Medium instead of waiting for your customer WordPress site? Can you post on LinkedIn even if you don’t have that great graphic ready for your post? Sure you can. Don’t wait, start right now. Give real value. There’s what I think is value, there’s what the recipient thinks is value, and there’s real value. I start with what I think is value, and I deliver that. If people don’t respond to it, either they don’t think it has value, or they don’t recognize the real value in it. Either way, I need to change my message to something else until the recipient thinks there is value. If it has real value, then it will spread and go big. Then I keep doing more of that. What do you wish you would have known 1, 2, or 3 years ago? If I run out of ideas of where or how I can share value I look at where I was a month, a year, or a decade ago. What do I know now that I wish I could pass on to my past self? Smile more. Smiling makes you more attractive and trustworthy, makes you happier, and makes others happier. But for me it’s awkward to smile, and when I do smile, or at least I think I’m smiling, it doesn’t always look like a smile to others. I need lots of practice on this one so I don’t always look so serious. Can you automate/outsource this? Remember #1 and #2? I have an obligation to spread my message as far as I can, as fast as I can. The more help I have, the better I can do this. Am I doing things someone else could do, without any negative impact on value? Do I need to create every single Instagram graphic that goes out, or can I create template, some guidelines, and then have someone else do the heavy lifting and I review the work to make sure it meets my standards? Where else can I automate, outsource, delegate, and otherwise multiply my output to serve more people, better? What would Gary Vee do? Gary Vaynerchuk is one of the best influencers of this generation because of his authenticity. He often gives the advice to reverse engineer the person you want to be like. I want to be like Gary in many ways (with less swearing) so I’ve been reverse engineering a lot of what he does. When I come across an opportunity or challenge I often ask myself how Gary would react to the situation. For example, I’m in China where Facebook, Twitter, Instagram, and other social media apps are blocked. But there are home grown Chinese apps that mimic these. Gary would master these apps and create a community on those. So that’s what I’m working on. The obstacle is the way. Just the title of Ryan Holiday’s book The Obstacle is the Way has been beneficial to me, even when I forget what’s inside it. When I’m faced with a problem or challenge in my business I try to see how this obstacle is showing me the way to do things better. Nobody wants to hire me to speak? Why is that? Oh, it’s because my website isn’t good enough and I don’t have a speaker reel to show off. The obstacle has just shown me the way, not only to get around or over the obstacle, but how to thrive. This is a simple way to get started as an influencer harnessing the power of positive affirmations. Now go create your own list, put it somewhere you’ll see it every day, read it every day, think about it every day, and do this for 30 days and let me know the results you get. Now let’s talk about what’s coming next. I’m collecting 366 affirmations to be published in a book/journal entitled The Influencer Affirmation Journal. Each page will include an affirmation and its source (if any), lines for notes/diary entry so you can record your thoughts, goals, and plans centered around that affirmation. Got a favorite affirmation you think should be in the book? Post it in the comments below! Want to make sure you don’t miss out on it when it’s released? Then sign up for my newsletter and stay in the loop.